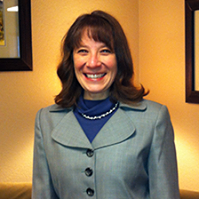 A native Prescottonian, Angela has been admitted to the practice of law in Arizona since 1995. Prior to entering private practice in 2011, Angela spent seven years practicing in lawyer regulation and ethics while working for the State Bar of Arizona. Angela spent the first seven years of her legal career in Flagstaff as a deputy public defender for Coconino County. After the birth of her first child, she worked briefly as a judge pro tem in the Flagstaff Municipal Court. Angela is a graduate of Prescott High School and attended Northern Arizona University where she earned her Bachelor’s degree. She holds a Juris Doctorate from the University of Arizona, College of Law. Angela recently served on the board of the Prescott Unified School District Education Foundation. She served a four-year term on the Yavapai Regional Partnership Council for First Things First, and a three-year term on the board of the Prescott Farmers Market. She is a member of Arizona’s Finest Lawyers, the Yavapai County Bar Association, and the Northern Arizona Women Lawyers Association. She is an active volunteer in scouting and her sons’ sports.